Yesterday, November 19, a Christian volunteer was punched in the face by a representative of the City of Calgary. The representative, a City of Calgary bylaw officer, is the same individual who has, week after week, issued various kinds of tickets including parking tickets to Street Church Ministries while at the same time ignoring other citizens engaged in similar activities right next to them. This most recent violent attack on a Street Church volunteer is only one of a great many examples of targeted bias against the efforts of the ministry. There have been illegal confiscations of property without warrants, denial of common rights to freely assemble, to expression, and even specific denial of rights to freedom of religion, including an arrest merely for reading from the Bible in a public park, and seizing of bibles and Christian materials from a peaceful vigil. Late in the morning, yesterday, in front of the new City Hall, Bogdan Stobiecki went to move the Street Church truck out of a ten minute loading zone, that was parked in the zone for less time than was allowable for that location. Two bylaw officers were waiting for him when he arrived. When he was getting into the truck one of the bylaw officers came to him and told him that he was not allowed to move the truck. Mr. Stobiecki told the peace officer "not to touch an anointed one of God". Then the officer hauled off and punched him in the nose. Police were called and initially refused to even take a statement. 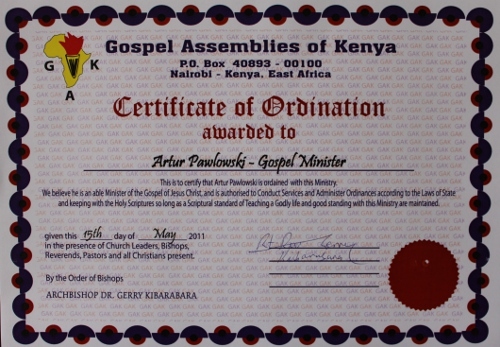 After Artur Pawlowski called the dispatcher and threatened to call until someone would take a statement, the police finally agreed to take one, but indicated that it was the word of Street Church volunteers against the officers’ word, and that most likely nothing would be done about the matter. "For over seven months we have seen repeated abuses of power, use of unprovoked physical attacks on our volunteers, stealing of our property, and the City administration doesn’t even blink an eyelash. Frankly it is disgusting. I haven’t seen this kind of corruption and abuse of power since I was under the communists in Poland. If that is not enough, our city officials are wanting to add more and more officers. I can’t imagine what they are going to do with all of these men. As a matter of fact, if the City really needed more officers, how is it that we continually see so many of them attending our meetings on a regular basis? In fact, even today there were around fifteen of them that came to the incident. Why would there be a need for so many officers? Today it was a bleeding nose, I don’t want to even think about what they will do to us tomorrow, if they get away with this. Calgarians truly have a reason to fear their officials. ", added Pawlowski. Street Church is currently looking into their legal rights regarding this matter. City representatives need to be accountable for their violent acts against citizens. Citizens of Calgary and media representatives interested in details regarding this matter are encouraged to contact Street Church Ministries directly at 403-607-4434 or www.streetchurch.ca. 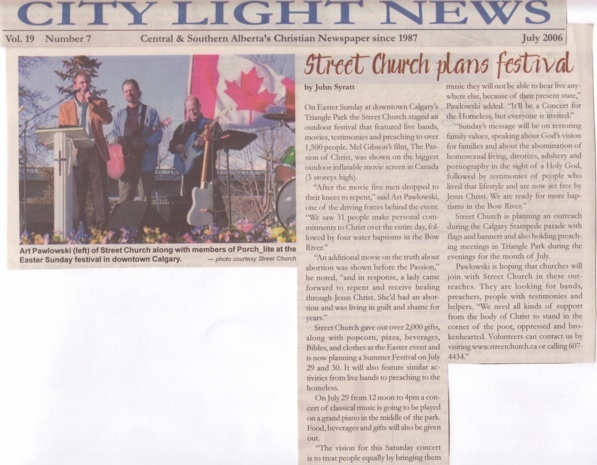 July 19, 2006 Artur Pawlowski Comments Off on Street Church plans festivals.